This is a sweet and very tender story about a baby and his loving parents who are readying him for bed. This book doesn't have the same wry sense of humor as Pete's a Pizza by William Steig but the premise is very similar. 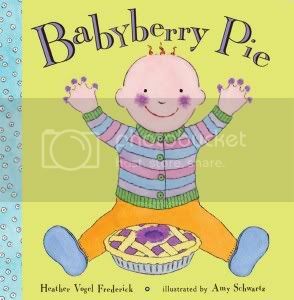 After a busy day of play, when the moon comes out, "it's time to bring the baby in for babyberry pie!" Baby receives a thorough bath, and then scampers out of his parents' reach, accidentally plopping a cooling pie on the windowsill on his head. There he sits, Jack Horner-like, with triumphantly purple-stained cheeks and fingers. This warrants a second bath, followed by a powdering of "sugar" (actually, baby powder) until he is tucked in to his "pie crust," otherwise known as a crib with blankets. I enjoyed the gentle, rhyming text and well as the gouache and ink illustrations which alternated between colorful full-bleed double-spread pictures of the little suburban blue house with the dark night sky, and clean single-page images of the round-headed, chubby cheerful baby. The lilac endpapers feature a repeating motif of berries. The family's yard appears enormous and the very round-faced moon with a funny little slip of a body dances along, watching the proceedings with interest, until she too falls asleep, snugged into a cloud outside baby's window. The mild pace and familiar family surroundings make this book a pleasant bedtime read. Highly recommended.